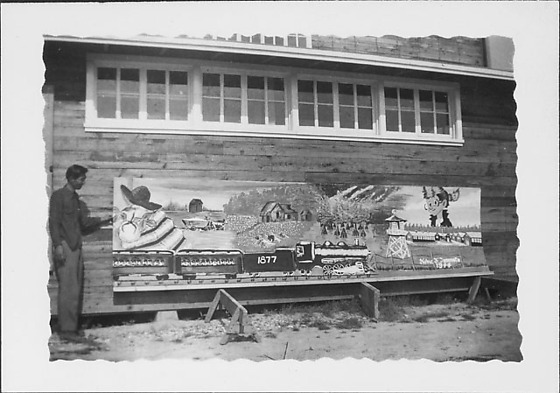 Mural titled, "To Rohwer," painted by high school student, Nobie Tanimoto, is propped on sawhorses against wall of wooden building at Rohwer concentration camp, Rohwer, Arkansas, 1944-1945. Mural depicts the train ride to Rohwer camp, featuring a freight train in foreground, passing three landscapes of farm, people picking cotton and mangroves in swamp with lightening storm; sunset over trees segues into an image of the Rohwer mascot, Lil' Daniel, above rows of barracks surrounded by barbed wire and a watchtower. Signed at lower right: Nobie F. Tanimoto 1944. Young man in dark shirt and trousers stands by panel at L. Image has irregular scalloped border. Appears to be a different version from mural in JANM collection (88.25.125F).